When I was married with a little baby, I thought our laundry would never end. Then, I'd think of my sister, with two BOYS and I'd be a lot better! Now that there are just the two of us, you'd think that laundry woes would be behind us. Not so much. 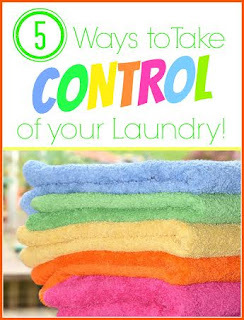 When I was a young woman, I would have loved this advice from Masshole Mommy about laundry. It's not that we have a lot, in fact, we have to wait a bit to get full load which means some of my favorites are buried in the laundry for a couple of weeks. I've done smaller loads, but I feel guilty when I do. I have a distinct advantage, though. My husband does laundry and is GOOD at it. When I was newly married (as in less than six months) I was at the apartment complex's laundry facility. My mom had done a great job of teaching me sorting and I was proud of them tips she taught me for getting great towels. My friend, Lori taught me how to fold towels with a three fold in order to save space and I'm still doing that 39 years later!! I placed a bunch of Bob's sweaters in the wash and proceeded to dry them. When I took them out of the dryer, they looked like they belonged to a bunch of monkeys! Teeny tiny bodies and long, long arms. I had washed and dryed Bob's 100% wool sweaters and they were ruined. There was no saving them. From that point on, Bob shared equally (and probably even more than,) on laundry duty! Laundry produces a lot of trash. Boxes from the dryer sheets, plastic bottles for softener and detergent, lint and of course, shrunken sweaters. I have always wanted to find a product that was a little better on the environment. When I heard about Good Sheets, I knew I loved the concept, but could they make it work? My first trial wasn't so great. The clothes were cleaned and smelled fantastic, but the static level was unacceptable. Plus, the company sent me only one sheet, so even if the results were good, I would never accept a single trial as a way to test a product. I answered the company's survey and told them I had received one sheet. They sent back 4 more and I am going to report to you my findings after 5 loads. The Whites. Our whites were fantastic! Bright and white, dirty things were very clean! No static and the laundry smelled amazing! The Darks. Harder to judge, but they smell wonderful. I had a pair of jeans used for gardening and they did get very clean and smell nice. No static. The Brights. Nice work! Again, great smelling laundry, little static and the brights looked colorful, not dingy. The Delicates. For me this is the real test. A lot of my blouses go into the delicates that I dry on low and take out before they are fully dry. Often the static is unbearable and I have to spray them with another product to make it manageable. Not this time! The fabrics smelled awesome and there was no static cling! The Towels. The towels smelled so nice and there was zero static cling. That was fantastic. My second trial with the product was so much more successful than the first. Thank goodness that the company decided to send a second batch. I loved how much space was saved in my closet and how easy it was to only reach in once for the product. I'm not sure how soon it will be before Good Sheets will be in your locals stores, but hopefully very very soon! I'm doing laundry at this very moment. I think the only thing I hate more than doing laundry is cooking dinner. Good sheets seems like something I should invest in! Laundry is a never ending battle in my house... with 3 kids we have a lot of laundry, and with 2 of them girls we can do an entire load of pinks and purples! Never thought I would have seen that. Too bad no one has created a way for the clothes to wash, dry and put themselves away! Now that would be awesome. I think it's awesome that Good Sheets sent you more sheets to test out, and I'm glad they worked! I'll have to be on the lookout for them as I'm always trying to lessen our impact. Sounds liek a product I would try. I 'll keep my eye out for them. I wonder why the static level was so much higher in the first load. It is good to hear that is was better later. Laundry is about the only chore that I don't mind doing. I have gotten behind a little lately and have my husband help with folding. I still use Bounce sheets for my clothes but don't use anything on my kids. It sounds like a very environmentally sound product. I could certainly use the extra space in my cabinets. I wish my husband good at laundry. I've been looking for a product that cover all types of fabric/color equally perfect. Hopefully Good Sheets will be on market soon, can't wait to try this product. I hadn't heard of this product before but I will definitely have to look for it. Thanks for sharing. I take control of laundry by paying my daughter to do it. I don't have to do it and she gets paid. That's a win win. I've never heard of this before but I'm horrible at laundry. I've destroyed quite a few of my husbands clothing so now he doesn't like me doing his laundry and I'm fine with that. I will have to share this with him. He would love it. I have heard of these magical sheets and I was very curious. I'm glad that you tested them out for us! The laundry is never-ending here...in fact I have a basket for every person in the house full right now. It is clean, but not put away...it never seems to get put away :-) I'm glad that you had a better experience the second time around! These sound pretty cool! I'm definitely amazed at how much laundry one or two people can accumulate in a short amount of time. It's a never ending job!